A tri-mode unit on the Rhymney line. Photo: Welsh government. The First Minister of Wales Carwyn Jones has hailed a “landmark moment” in the future development of his country as plans of how £5 billion will be spent to transform its railways have been revealed. The announcement follows the end of a 10-day standstill period and the official award of a 15-year contract to operate and develop the next Wales and Borders rail franchise, as well as the proposed South Wales Metro, to KeolisAmey. The joint venture will work with the not-for-profit organisation Transport for Wales (TfW) – running all services under its brand – and will take over the franchise from incumbent operator Arriva Trains Wales on October 14, 2018. The Welsh government has said passengers will see the frequency and quality of the Wales and Borders services improved over the course of the next franchise. Plans include spending £800 million on rolling stock, which will see capacity boosted by 65 per cent as every train is replaced by 2023. 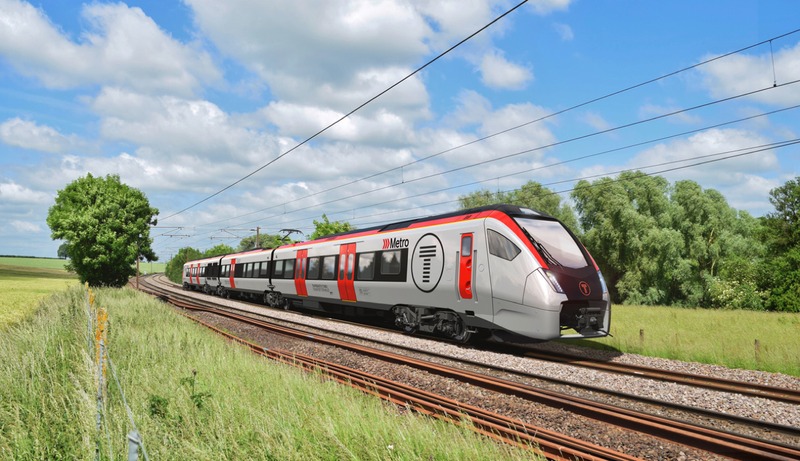 By 2023, 95 per cent of journeys will be on brand new trains – 50 per cent of which will be assembled in Wales – the government has pledged. KeolisAmey has revealed that this includes new tri-mode trains for services from Penarth, Barry and Bridgend to destinations north of Cardiff Central. Currently there are no trains being assembled in Wales but Spanish manufacturer CAF is building a factory in Newport. 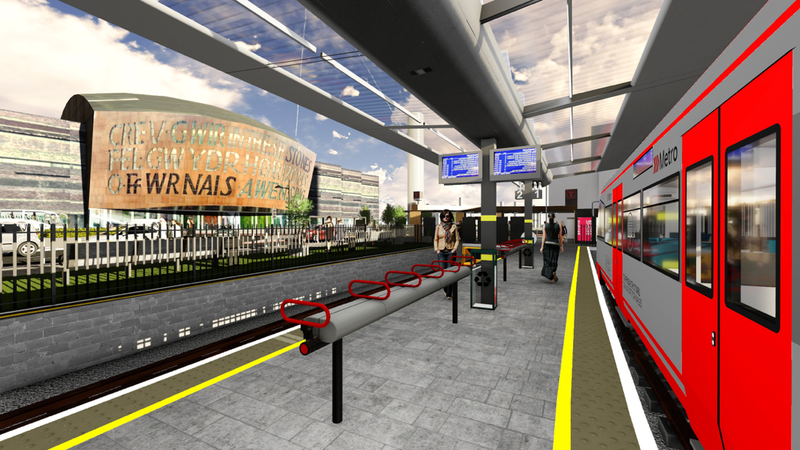 At least four new stations will also be built: Gabalfa, Crwys Road, Loudoun Square and the Flourish; and all of the franchise’s 247 stations will be modernised thanks to an investment of £194 million. The Welsh government is aiming for all of these stations and its overhead lines to be powered entirely by renewable energy – at least 50 per cent of which will be sourced in the country. A £15 million fund will make the stations more accessible and a new app will be launched to allow customers requiring assistance to ‘turn up and go’ from April 2020. As well free internet access on 85 per cent of journeys by 2024, it has been announced that Sunday services will be boosted by 61 per cent as an additional 294 services across Wales are introduced, creating a seven-day-week service. On its website, TfW has said that £738m will be spent transforming the valley lines to Treherbert, Aberdare, Merthyr Tydfil, Rhymney and Coryton, electrifying 172km of track and upgrading infrastructure in the process. Seven new community rail partnerships employing some 30 ambassadors will be introduced too. In addition, an extra 600 members of staff will be recruited into a range of roles – 200 of which will be on-train customer service staff – to deliver the new service and 30 apprenticeships will be created each year over the duration of the franchise. The Welsh government said passengers will start to see service improvements from December 2018. It added that by December 2023, passengers will be able to take advantage of an additional 285 services each weekday across Wales, which is an increase of 29 per cent. The First Minister of Wales and transport secretary Ken Skates officially announced the new contract and disclosed further details of the franchise at the Railway Training Centre at Coleg y Cymoedd, Nantgarw on June 4. Carwyn Jones said the contract, which sees rail powers devolved to the Welsh government, marks the start of a new chapter for services in Wales. It also brings to a conclusion four years worth of work to develop the new franchise. He added: “The way we shaped this procurement was different. We put passengers’ priorities at the centre of our thinking and threw out a challenge to all of the bidders to address the concerns they had about seat capacity, journey times and service frequency. People said they wanted affordable fares and newer, cleaner trains and we have worked hard to ensure this is reflected in what we are launching today. The train shown appears to be a Class 745 train, which are built be Stadler in Switzerland! Class 142’s and Class 143’s Pacers are due to be replaced and are facing the scrap. Whilst Class 150’s, Class 158’s and Class 175’s are to be replaced and might be going elsewhere. Or will the new franchise retain the Class 175’s. Plus the picture of the train is actually a computer graphic of the Stadler Flirt Class 755 Bi-Mode on the London-Norwich “Great Eastern” main line but in a Greater Anglia livery with South Wales Metro “T” logo on it. But its good that Stadler are to manufacture new trains for Wales.